Photograph of the last edition of ‘Pebble Mill at One’ in 1986, taken in Studio C, probably during rehearsal, or whilst prepping during a music number or VT insert. 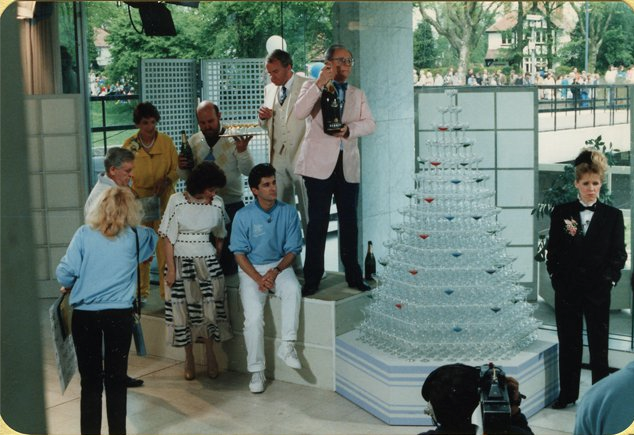 Included are, left to right: Magnus Magnusson, Marian Foster, Canon John Ely, Marjorie Lofthouse next to Paul Coia (seated), Michael Smith, with Josephine Buchan next to the impressive champagne pyramid! The floor manager in the foreground is Caroline Matthews.